Ben Wright wanted to create a new patio at his home and started by asking questions in the Brew Cabin before bringing out the tools and getting stuck in. It took me about 2 months to complete (evenings and weekends only) battling against a bad back, groin injury and appalling summer weather! As you can see from the picture, I decided to keep the existing flags and pave round to form a pattern. I'm fairly pleased with the result considering it was my first time - the only slight problem is the slope being a little too much either side (almost visible from the pic) however, this is better than no slope at all I guess. 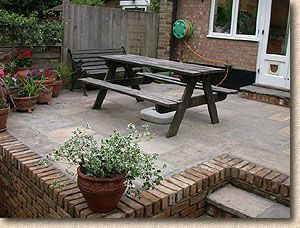 Here are the patio photos, all best wishes and many thanks for your advice. We are very pleased with it and I'm not sure where we would have ended up if we hadn't spoken. Having seen Indian Sandstone and reclaimed york, I settled on the Yorkstone. 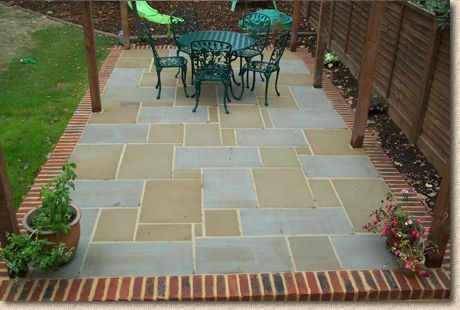 The sandstone was good but the Yorkstone seems in a different class. The terrace is now finished and we are very pleased. 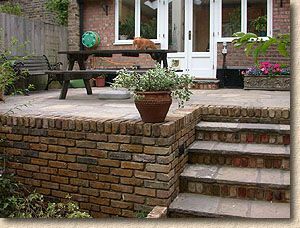 The yellow stocks go well with it and the paving feels as if its not going anywhere, ever. Talking to you was a major help in sorting out my ideas and what to expect, I even printed off the "how to lay " guide and left it for my builder ("Oh look, isn't this interesting") in case they were in doubt. 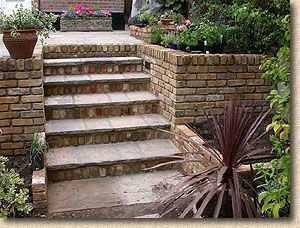 I also worked out I needed to decide where the steps were to go and tell the builder and the final effect is very good. 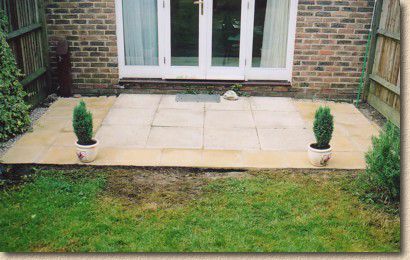 "I did have help with this patio, otherwise I would still be doing it now. But the setting out (falls, pattern, etc) and the selection of materials, was again down to the information on your website." 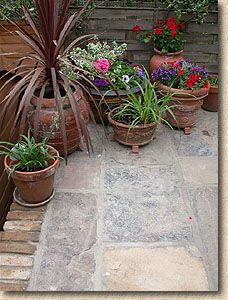 "The paving is sawn Yorkstone (Manor Diamond Sawn with a fettled edge - courtesy of Bingley Stone). 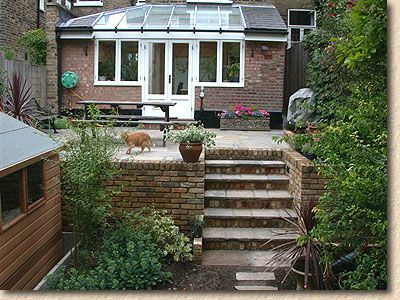 The property is 50's built, and given the relatively small size of the patio (6m x 3m) I felt riven would look out of place. 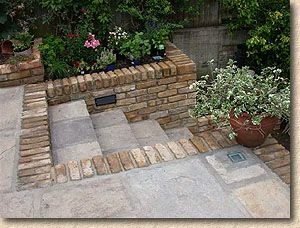 The fettled edge was only because Bingley Stone had had a cancelled order so this was available immediately (£39/m² delivered). Sawn six sides was at least a 6 week delivery, so I settled for the fettled!"